We Americans really have it so easy. I'm not saying we should necessarily feel guilt over that, but we should recognize how we won the birth-lottery and were born in a prosperous country that is relatively safe and free from war. And that for millions of people around the world, war and poverty are everyday challenges, not just something seen on the nightly news, somewhere a long way away. Ten-year old Sandra wasn't so lucky. After a great start to life in a beautiful country and born to a supportive, loving family, Sandra has everything ripped from her when war forces her family into a Congolese refugee camp. At age ten, Sandra was a survivor of the Gatumba Massacre, and she and what was left of her family were flown to the USA to start a new life in Rochester, NY. SUMMARY: Sandra remembers the night of August 13, 2004, when her Congolese refugee camp was brutally attacked in the Gatumba Massacre. She was only ten-years old. From there, Sanda emigrates to the USA, attends an American middle school, and becomes a voice for immigrants and refugees. REVIEW: Though the subject matter was incredibly sad and violent, the conversational first-person narrative made this easy and engaging to read. I love Sandra's quiet power in how she compares her life in The Democratic Republic of the Congo and her new life as a middle-schooler in the USA. Some of the comparisons are funny, and some are just horribly sad. I love the bottom line message about how race in the USA is a much bigger deal than it is in Africa. Sandra talks about how she never really thought about her skin color in Africa, even though there were many different skin tones and even white people in Africa, it wasn't a big deal until she got to the USA. She also tackles large issues like poverty, everyday racism, PTSD, and depression. I loved this book for it's strong narrative voice and its ability to tell a very needed story in a simple and engaging way. This book is easy to get into right from the start and stays poignant all the way through to the very end. Though she hobnobs with celebrities by the end of it all, Sandra remains a humble person and simply wants to get her voice out there and make a difference for the millions of displaced individuals in Africa and around the world. THE BOTTOM LINE: A must-have for any middle or high school library. 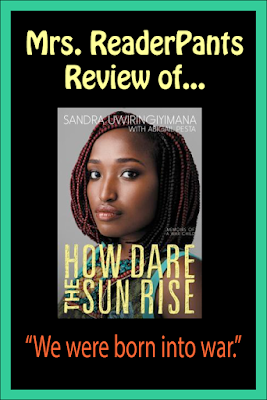 How Dare the Sun Rise tackles important issues like war and race with quiet dignity and hope. Beautifully-written and moving. STATUS IN MY LIBRARY: On-order.